Sometimes we can go home again, and if we’re lucky, the experience can be even sweeter than the first time around. 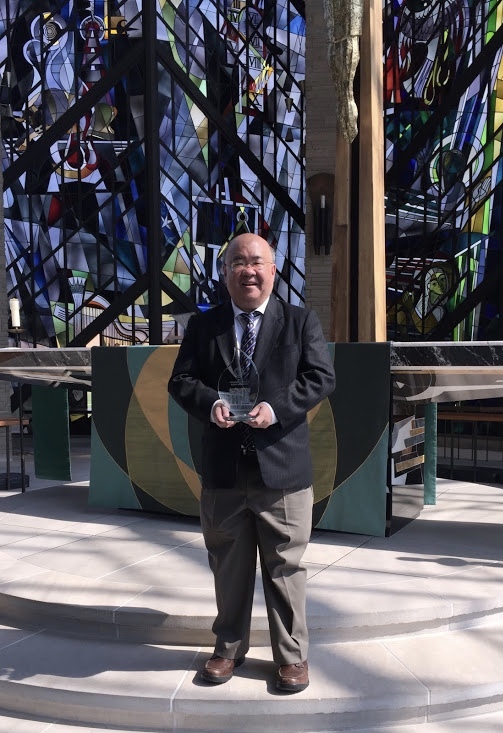 In a year of ups and downs, one of my most memorable, positive experiences was returning to Valparaiso University in northwest Indiana, my undergraduate alma mater, to receive an Alumni Achievement Award during fall Homecoming festivities. 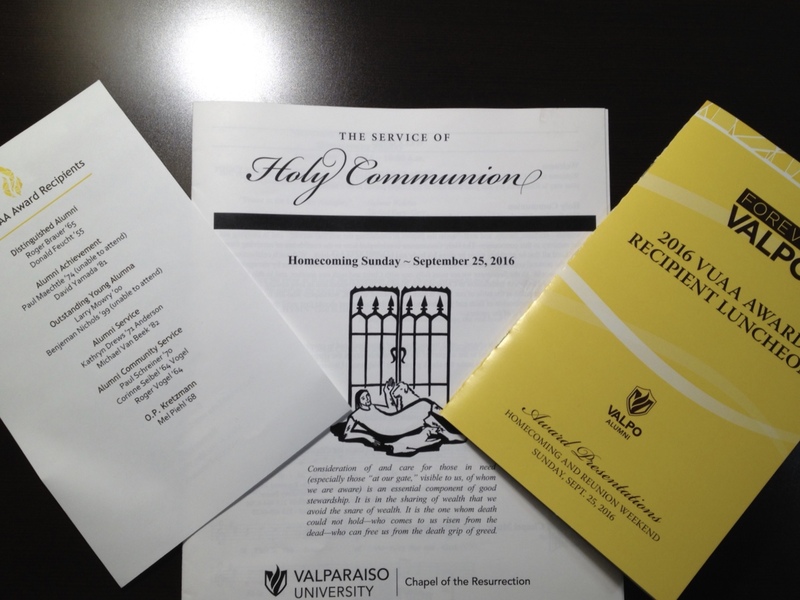 The awards presentation ceremony was part of a Sunday Homecoming service in VU’s Chapel of the Resurrection, followed by a luncheon in the new student union. From the vantage point of my 1981 graduation from Valpo (the school’s informal monicker), this was an unlikely return to campus. 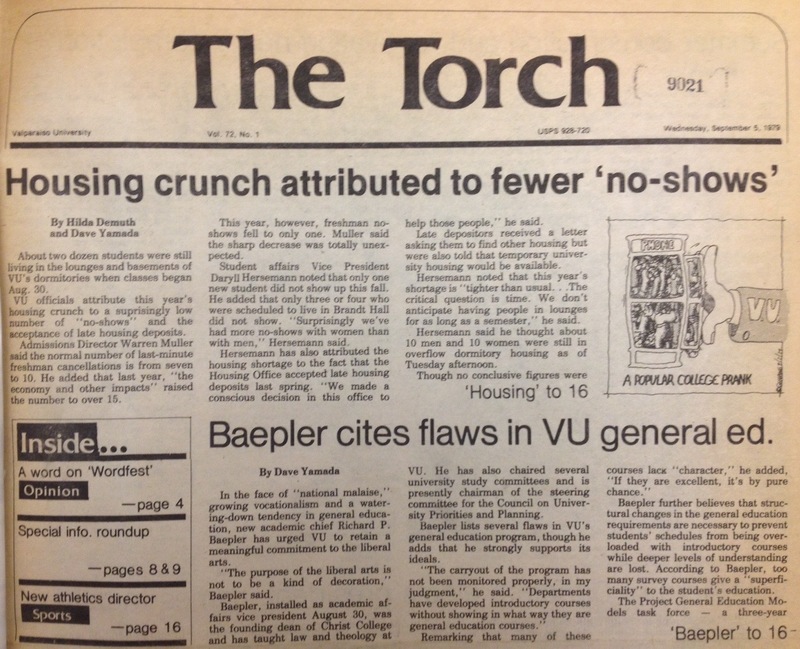 As an undergraduate, I was a department editor and writer for The Torch, VU’s student newspaper. At the time, The Torch editorial board was something of a campus rebel cell, post-Sixties edition. Though too young to have experienced the student movement, we were given to questioning things and mildly anti-authoritarian by nature. Whether it was creeping vocationalism that threatened the liberal arts, behavioral excesses in fraternity behavior (“Animal House,” a wildly popular movie during that time, was influential), or challenges with various diversities on campus, we believed that our editorial mission was to take on the university for its supposed shortcomings. Some of our critiques were insightful, the products of bright young minds applying the lessons of a liberal education to the institution that provided them. Others were more sophomoric, using the print medium to launch a few post-adolescent salvos. Mine mixed the two categories in a sort of hit-or-miss fashion. In any event, by the time Commencement rolled around, I had internalized those grievances and smugly assumed that I had outgrown the place. However, my relationship with VU had been in a state of positive change for some time, marked by a steadily growing appreciation for the excellent education I received there and for friendships forged via experiences such as The Torch, a life-changing semester abroad, and everyday dorm life. 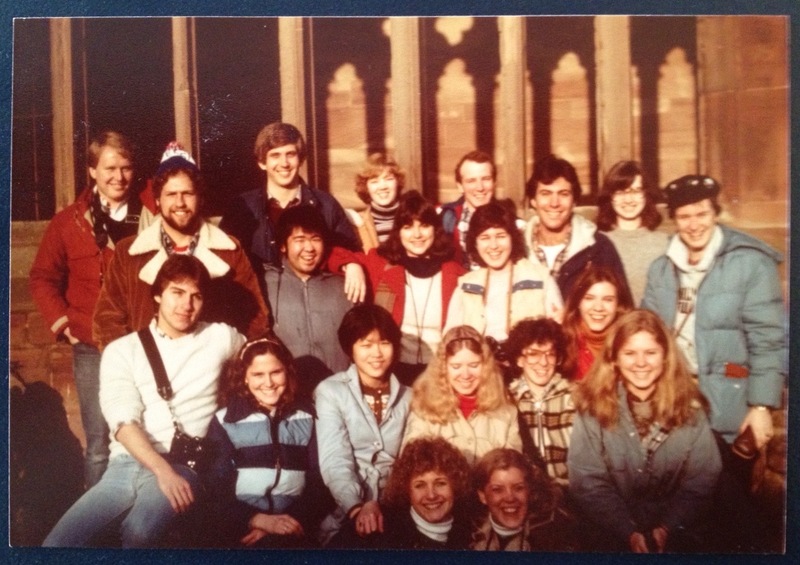 In fact, I was extremely blessed to have a group of friends, mostly fellow alums from our close-knit Cambridge, England study abroad cohort and several of their spouses, joining me for the Homecoming award ceremonies. (I know that “blessed” is an overused term, but that’s how I felt.) 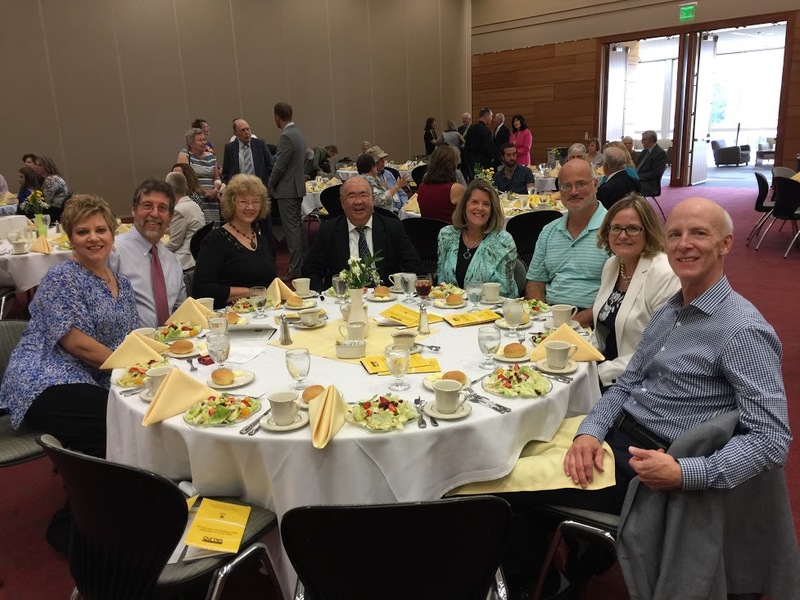 During my extended visit, which included time as a visiting scholar at VU’s law school, I also enjoyed welcomed opportunities to reconnect with other friends from my VU days. Returning to campus was both nostalgic and slightly disorienting. For many years after our graduation, Valpo’s physical landscape had remained basically the same. However, during the past decade or so, new buildings have sprouted up seemingly everywhere, and even some streets and pathways on campus have been rerouted. On Homecoming weekend, our shared memories mixed with exclamations over how building so-and-so had disappeared. The downtown area of the small city of Valparaiso also had changed markedly, with a much greater variety of restaurants and public spaces. It was fun to make these discoveries with my friends, as if we were once again undergraduates exploring England and the European continent — even if this time we actually were in America’s heartland. 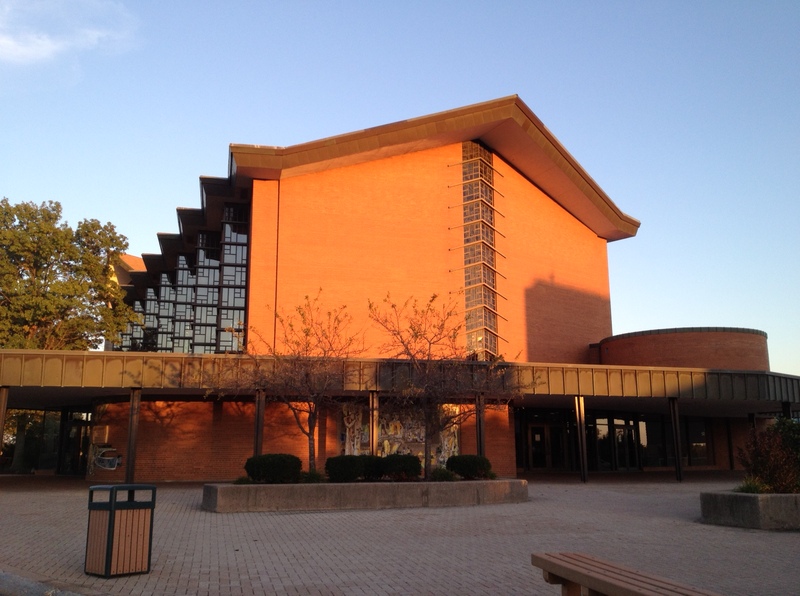 Valparaiso’s longstanding affiliation with the Lutherans and the importance of faith traditions in general are core parts of its institutional mission. During the early decades of the last century, Valpo was a secular, independent university well known for its vocational training. Hard times would visit the school, however, and its survival was in question until the Lutheran University Association stepped in to buy it in 1925. Among the continuing manifestations of this association are daily Chapel services, open to those of any denomination. In my case, it would be an understatement to say that I was not a frequenter of Chapel services as a collegian. However, at Homecoming I now found myself unexpectedly moved by the fact that the University would devote a Sunday worship service to recognizing its graduates. As a denizen of higher education, I know well the differences between giving obligatory nods to alumni/ae honorees and showing genuine appreciation. This was a very touching example of the latter. The memories stoked by this weekend went well beyond student life and into the realm of world events that transpired around us as undergraduates. Among other things, little did we know at the time that we were bearing witness to the emergence of at least two major mega-trends — the primacy of the Middle East as an American foreign policy hot spot and the conservative resurgence in American politics — that would help to define our civic lives well into middle age. In November 1979, young Islamic revolutionaries took some 60 American hostages during a seizure of the U.S. Embassy in Tehran. The Iranian hostage crisis, as it soon would be tagged, would endure for nearly fifteen months until the hostages were freed in January 1981. 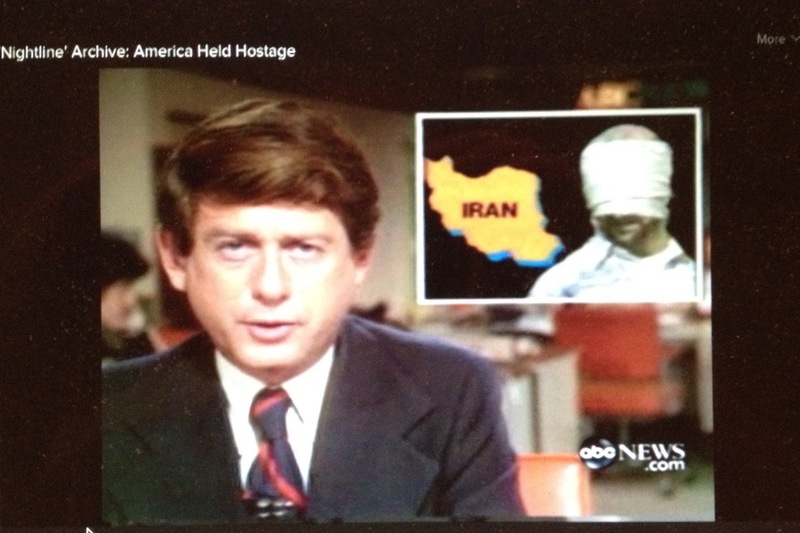 During that time, ABC journalist Ted Koppel became a national media figure with his daily hostage crisis updates on “Nightline,” a program that followed the late night local news. At Valpo, many of us tuned in each night in our dorm rooms, watching on our rabbit-eared portable television sets. The fall of my senior year also marked my first opportunity to cast a general election ballot for President. Jimmy Carter was the Democratic incumbent, having successfully run on an anti-Washington platform in 1976. However, change was brewing in the form of a conservative movement that would sweep Ronald Reagan and a group of new Republican Senators and Representatives into office. I was deeply into politics at the time. In fact, I was majoring in political science and planning to go to law school as preparation for an eventual political career. My own political views were in a state of flux, moving from right to left. In terms of presidential candidates in 1980, I had become enamored of an Illinois Congressman named John Anderson, a one-time conservative whose own views had become more liberal over the years. Anderson ran as a liberal Republican in the spring presidential primaries and then decided to leave the GOP to pursue an independent candidacy in the fall. I would serve as the Northwest Indiana coordinator for his independent campaign, a volunteer assignment that said less about my political organizing skills and more about the green talent the campaign had to rely upon in certain parts of the country. Looking back, I now understand that Anderson’s departure from the Republican Party represented a harbinger of things to come. The 1980 election marked the beginning of the GOP’s rightward turn and a coming out party for a conservative movement that has dominated much of American politics since then. 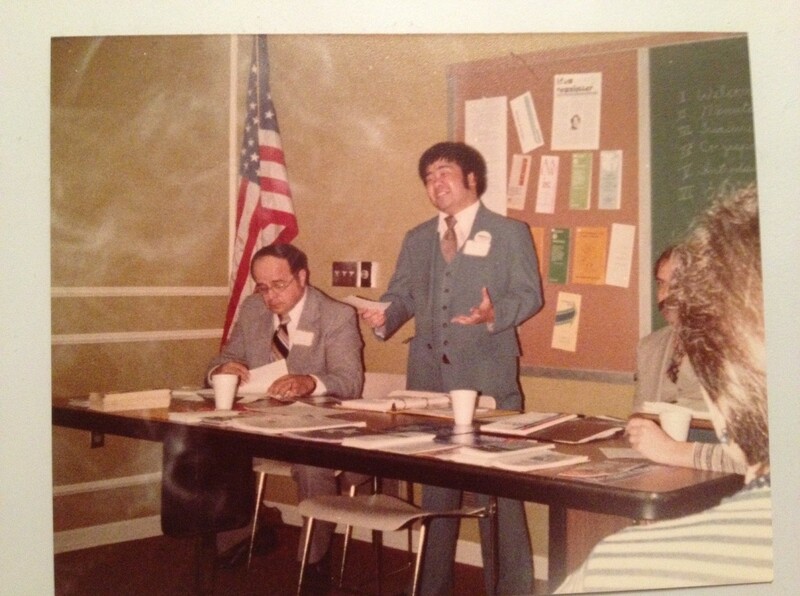 In my best polyester suit, I represented the Anderson campaign in a 1980 presidential debate sponsored by the Porter County, Indiana chapter of the American Association of University Women. My collegiate years at Valpo felt heavy, as if I was carrying the weight of my future on my shoulders, fueled by a growing desire to explore life outside of my native Indiana and anxieties over where I would be and how I would fare. In 1982 I would decamp to Manhattan for law school at New York University, thinking that Indiana would be viewed mainly from a rear-view mirror. Fast-forward to 2016: During a moment in the alumni hospitality tent at the Homecoming football game, I remarked to VU President Mark Heckler that it felt very light to be back on campus — a stark contrast to my emotional center of gravity as an undergraduate. Indeed, this return to VU was accompanied by gifts of appreciation and maturity and was made especially meaningful by the company of dear friends who now richly deserve the label “lifelong.” A homecoming can’t get much better than that. very nice piece, David. Congratulations! Aww, thanks Patrick! Best New Year’s wishes to you and Martha!